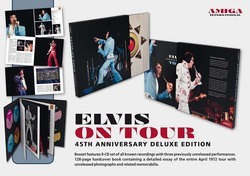 Amiga International releases a long awaited LIMITED-EDITION boxset featuring 9-CD�s, all remastered, of all known recordings made for the Golden Globe Award-winning concert documentary ELVIS ON TOUR. This will include the premiere of the complete rehearsal recorded in Buffalo, NY on April 5, 1972, with three previously unreleased performances. The 13-inch boxset also includes a huge 128-page hardcover book containing detailed essays of the entire April 1972 tour with RARE photographs and related memorabilia. This highly anticipated boxset was released on December 28th 2017, and is now close to selling out!